Tehran, Iran, Jul. 12 � Thousands of residents demonstrated this evening in front of the main gate of Tehran University, calling for the release of political prisoners. Demonstrators included relatives of political prisoners, many of whom turned up with photos of their relatives presently in prison in the notorious Evin Prison in Tehran and Gohar-Dasht Prison in Karaj. They chanted �Free all political prisoners� and �In Iran, the cry is freedom�. Many called for the immediate release of jailed journalist Akbar Ganji. There was a heavy police presence. State Security Forces and plainclothes agents stormed at the crowd with batons, clashing with demonstrators and injuring some seriously. A number of protestors were also detained after holding up photos of Iranian opposition leader Maryam Rajavi. A number of political prisoners in Evin and Gohar-Dasht prisons have been on hunger strike for more than a month in protest to their prison conditions and as part of a boycott effort of the June presidential elections. A Reuters journalist saw policemen beat several protesters, including young women, in streets surrounding the university and was struck by batons several times himself. Other reporters and photographers were also forced to leave the scene, witnesses said. TEHRAN, 14 July (IRIN) - Police used violence to break up a student demonstration in the Iranian capital on Tuesday, amid escalating protests and concern over the deteriorating health of political prisoner and journalist, Akbar Ganji. The police beat both male and female demonstrators and a local Reuters journalist covering the story was also attacked with batons as they tried to disperse the crowd outside Tehran University, in the centre of the city. Akbar Ganji, Iran's most famous political prisoner, was given a six year prison sentence in 2000 after following his trial on a variety of charges. Some charges related to an article he wrote that linked some of the country's top officials to the 1998 murder of dissident intellectuals, known as the 'serial murders.' He was temporarily released from prison in May for medical care, when he came to the end of a 43-day hunger strike. However, since returning to prison in June, he has resumed his hunger strike and he is now reported to be suffering severe respiratory problems. Ganji's worsening health has prompted strong reactions from the West. As his supporters gathered at the university, President Bush released a statement calling for Ganji's release. The authorities in Tehran reacted angrily to what they see as outside interference in domestic judicial affairs. State-run radio reported Iran's foreign ministry spokesman, Hamid Reza Asefi, as saying: "The White House talks about violations of human rights in Iran while the world hates the US violations of human rights in both Guantanamo Bay and Abu Ghraib prisons [the two controversial US detention facilities holding untried terror suspects]." On Wednesday, 33 Iranian political activists wrote a letter to the United Nations warning that Gangi's life is in danger. "For the sake of human rights, (we) ask you to intervene directly in Ganji's case and follow it as an urgent human rights issue," the activists said in a letter to UN Secretary-General Kofi Annan. Ganji said in a statement released in May: "I protest against my illegal and unjust imprisonment, all the more so because I cannot even pursue my treatment outside Evin prison. I am beginning an unlimited hunger strike this evening. No one should be imprisoned - not even for a second - for expressing an opinion." There are also concerns about the health of Nasser Zarafshan, another political prisoner held in Tehran's notorious Evin prison. Zarafshan was the lawyer for the defence in the 'serial murders' case and he was detained in August 2002 on charges of divulging state secrets. He was sentence to five years in prison and 70 lashes. In the past, the US-based pressure group Human Rights Watch (HRW) has called Iran the world's biggest prison for journalists and in recent years, more than 100 publications have been shut down by Iran's hard-line judiciary, on charges ranging from criticising the leadership to 'insulting religious sanctities'. Journalists and political dissidents are fearful that under Iran's new ultra-conservative President-elect, Mahmoud Ahmadinejad, political crackdowns could increase as the power of the ideological right continues to grow. کمیته دانشجوئی دفاع از زندانیان سیاسی همراه با چند سازمان دیگر و با حمایت برخی چهره های فعال در زمینه حقوق بشر و فعالان سیاسی و دانشجوئی، فراخوانی منتشر کردند برای گردهمائی بعدازظهر سه شنبه در برابر دانشگاه تهران به منظور حمایت از تقاضای اکبر گنجی، روزنامه نگار زندانی. مسعود باستانی، روزنامه نگار پیگیر وضع گنجی و از امضاکنندگان فراخوان این تجمع، در مصاحبه با رادیو فردا می گوید جمع کثیری از دانشجویان مستقل و دانشجویان نزدیک به دفتر تحکیم وحدت و اعضای دفتر تحکیم وحدت و سازمان ادوار تحکیم وحدت و گروه اتحاد دمکراسی خواهان نسبت به این فراخوان اعلام حمایت کردند. وی امیدوار است این تجمع اعتراض گنجی را به گوش افکار عمومی برساند. مسعود باستانی (روزنامه نگار مستقل، تهران): با توجه به اینکه اعتصاب غذای اکبر گنجی مدت زیادی است که طول کشیده و قوه قضائیه هیچگونه واکنشی نسبت به این اعتصاب غذای این زندانی سیاسی که می کوشد تا به وسیله اعتصاب غذا یعنی تنها وسیله مبارزه در زندان تلاش می کند که حقوق خود را استیفا کند و اکنون در آستانه سی امین روز اعتصاب غذای مجدد گنجی بعد از بازگشت به زندان اوین هستیم، نگرانی های بسیار زیادی را در مجامع سیاسی و فعالین سیاسی و دمکراسی خواهان در ایران به وجود آورده است. مسعود باستانی: این حمایت از طرف گروه های سیاسی داخلی از جمله جمع کثیری از دانشجویان مستقل و دانشجویان نزدیک به دفتر تحکیم وحدت و اعضای دفتر تحکیم وحدت وسازمان ادوار تحکیم وحدت اعلام شده و از سوی دیگر، گروه اتحاد دمکراسی خواهان اعلام حمایت کردند و پای آن را امضا کردند و از سوی دیگر حساسیتی که خیلی از سازمانهای حقوق بشری و سازمانهای بین المللی دنیا نسبت به وضعیت و سرنوشت گنجی دارند و در بیانیه های مختلف سازمان عفو بین الملل و سازمان گزارشگران بدون مرز و بقیه سازمان های حقوق بشری دنیا از وضعیت گنجی داشتند، یقینا این حرکت حمایتی گسترده... حمایت خواهند کرد. امیدوارم که در ساعات باقی مانده تا رسیدن به زمان این تجمع، ما شاهد حمایت های گسترده باشیم. مسعود باستانی: بله، با توجه به تجربیات گذشته در برگزاری چنین تجمع های اعتراض آمیزی بوده، معمولا رفتار نیروهای انتظامی و افراد بر کنترل و مهار این گونه تجمع ها بوده و ما امیدواریم با رعایت خواسته ها و رعایت نظم و امنیت توسط شهروندان شرکت کننده در این تجمع، حداقل فضا را برای برگزاری ارام و منطقی و آزاد این تجمع مهیا بشود. علیرغم اینکه از سوی سازمان ادوار دفتر تحکیم وحدت، امروز هم درخواست مجوزی به استانداری تهران داده شده و از ا ستانداری تهران درخواست شده که در حد توانائی امنیت لازم برای برگزاری این تجمع را تامین کنند. The students news agency ISNA earlier reported that about 200 students had gathered to protest the jailing of Ganji, who has been on hunger strike for a month. The students who also demanded release of all political prisoners clashed with dozens of police officers attempting to force the protesters to withdraw. Reporters and photographers were also forced to leave the scene, witnesses said. Ganji was said by his wife to in a critical health condition as a result of the hunger strike. The dissident was temporarily released last May for treatment of pneumonia but had to return to jail just before the June 17 presidential elections, starting a renewed hunger strike. Ganji, 48, was sentenced in 2000 to six years in prison after being charged with "disgracing" Iran in front of "counter- revolutionaries" at a controversial conference held that year in Berlin. He also linked Iranian leaders to assassination of dissidents. Iran's most prominent jailed investigative journalist, Akbar Ganji, has been jailed for the last five years because of his critical articles and his investigation into the murders of political dissidents and intellectuals -- murders in which, he says, top Iranian officials were involved. Now, Ganji's wife says that he has been on hunger strike for a month as he demands to be released unconditionally from prison. On 12 July, a gathering is due to take place in Tehran in his support. PRAGUE, 12 July 2005 (RFE/RL) Despite his poor health, Iran's top journalist Akbar Ganji is determined to continue his hunger strike until his unconditional freedom. Ganji's wife Massoumeh Shafii was able to visit him on 11 July. She told RFE/RL that he believes a hunger strike is the only way to secure his freedom. She also says Ganji has lost more than 20 kilograms as a result of his hunger strike, but that his morale is good. "He is still on a hunger strike. His weight is 55 kilos now. He has lost a lot of weight during his hunger strike, he's without any force, the color of his face is yellow, and he tries very hard to speak normally," Shafii said. "His physical condition is not good, but he is in excellent spirits." The journalist is reported to be subsisting on water and sugar cubes. Ganji is known for his criticism of the Iranian establishment. He has said that his five years in jail, including several months in solitary confinement, has made his views even more radical. In his two-part book titled "Manifesto Of Republicanism," Ganji has criticized the authority of Iran's Supreme Leader and said that under the country's current governmental system real democracy cannot be achieved. Ganji was temporarily released from jail at the end of May on medical grounds. He suffers from asthma and back pain. Prior to his temporary release, he had also been on a hunger strike to protest his detention conditions. Several days after his release, he spoke with Radio Farda and called for a boycott election of the 17 June Iranian presidential election. "Those who are theoretically and practically committed to Iran's constitution, if they go after reforming the current ruling establishment, maybe they are taking the right way," Ganji said at the time. "But if someone's main concern is democracy and establishing a democratic regime that is bound to human rights, then that person would not be willing to reform the establishment; his main issue would be how to move from a un-democratic regime to a democratic regime. And I've written in the first and second 'Manifesto' that under the current regime I have no hope for any reform leading to a transition toward a democratic system." On 11 June, shortly after making this statement, Ganji was returned to prison. 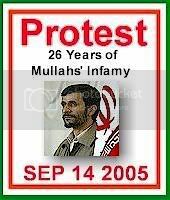 Ganji was sentenced to 10 years in prison in 2001 on charges ranging from harming Iran's national security to spreading lies against the country's leaders. His sentence was later reduced to six years on appeal. Ganji's wife told RFE/RL that Iranian officials have told him that unless he changes his views, he will not be released even after his jail term is over. "Mr. Ganji says, �Even after the few months left of my jail term would be over, [the authorities ] will not free me because they have said it to me very clearly,'" Shafii said. "Even Trade Minister Mr. Shariatmadari -- who visited Ganji in jail two years ago -- told him: �the position of the establishment is that you should stay in jail until you [retract] what you have written in the 'Manifesto.' You have to say that you were wrong.' [Therefore] Ganji considers his unconditional release as the only solution." In a recent open letter written from jail and published on several websites, Ganji said he will not take back his words and he will not show remorse. There have been widespread calls for Ganji's release, including from Nobel Peace Prize Laureate Shirin Ebadi. In a June 30 interview with Radio Farda, Ebadi expressed concern over Ganji's health. The EU, the United States, and several human rights groups have also called on Iran's judiciary to free Ganji. Ganji's wife says she has written to many humanitarian organizations about his husband's condition. "We are worried and there is nothing we can do," Shafii said. "We are just witnessing how Akbar Ganji is fading out. We've tried all the [channels] inside Iran but unfortunately there haven't been any results. We've been also following the case outside Iran, we've been sending letters to the European parliament, [EU foreign and security policy chief] Javier Solana, to the UN, to [UN Secretary-General] Kofi Annan. We've sent letters to all places we could and [brought their attention] to Mr. Ganji's case. There is international pressure but it's not clear when the Iranian officials will respond." Today, a group of human rights activists, students and families of political prisoners have announced they will gather in front of Tehran's university to express their concern over Ganji's "critical" condition and to protest against the violation of his rights. They say "if something unpleasant happens to Ganji, Iran's rulers will be held responsible." Relatives of political prisoners and thousands of Tehran residents gathered this afternoon outside the main entrance to Tehran University and its surrounding area. Demonstrators, while chanting �free all political prisoners� and �in Iran, cry is freedom�, called for the release of all political prisoners. Families of political prisoners brought photos of their relatives who are locked away in the notorious prisons Evin and Gohardasht (in Karaj). State Security Forces and plainclothes agents tried to bring about an end to the protest by brutally attacking and beating the crowd. A number of demonstrators were injured seriuosly. A number of protestors and supporters of the People�s Mojahedin Organization of Iran held up photos of the leader of the Iranian Resistance Mr. Massoud Rajavi and the President-elect of the Iranian Resistance Mrs. Maryam Rajavi. While brutally attacking such people, agents of the SSF arrested several of them. Following the attack by the SSF, the crowd dispersed and regrouped in nearby streets and continued their demonstration despite continued clashes. The regime�s suppressive forces blockaded the streets to prevent people from joining the demonstrators. Political prisoners in Evin Prison and Gohardasht Prison in Karaj have been on hunger strike for more than a month in protest to prison conditions and lack of basic commodities, and as part of a boycott of the regime�s sham presidential elections. TEHRAN, July 12 (Reuters) - Iranian police beat dozens of protesters with batons on Tuesday at a demonstration to call for the release of Iran's most prominent jailed journalist. About 150 people, mostly students, had gathered in front of Tehran University chanting "political prisoners must be freed" when dozens of police moved in to break up the protest. The rally was in support of Akbar Ganji, an outspoken critic of the Islamic state's clerical leadership who was sentenced to six years in jail in 2001 for articles he wrote alleging links between senior officials and the murder of political dissidents. Ganji's family and lawyers say he is suffering from poor health and needs medical treatment outside prison. They say he has been on hunger strike for more than 30 days. Judiciary officials say Ganji is in good health and is not on hunger strike. A Reuters journalist saw police beat several protesters, including young women, in streets surrounding the university and was struck by batons several times himself. It was not immediately clear if police made any arrests. 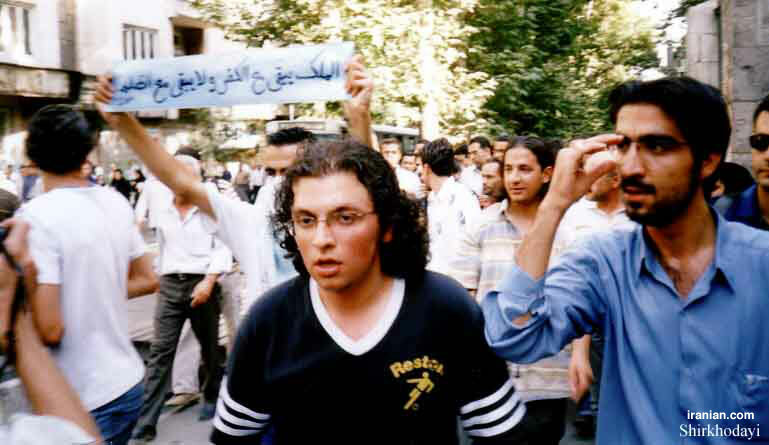 12 July 2005 (RFE/RL) -- Clashes between students and police occurred today in front of Tehran University during a demonstration against the imprisonment of an Iranian dissident, Akbar Ganji, Radio Farda reported. Student protesters, demanding the release of Ganji and other political prisoners, clashed with police who were trying to disperse the demonstration. Ganji�s wife, Massoumeh Shafii, today told RFE/RL that her husband is in critical condition as a result of a month-long hunger strike. In 2000, Ganji was sentenced to six years in jail for publicly criticizing the Iranian authorities. Today, Tuesday the 12th of July, scores of demonstrators responded to a call for gathering in support of Akbar Ganji and all political prisoners. This demonstration was held in front of Tehran University from 5:00 pm, with an initial count of three hundred demonstrators. Later the number of demonstrators turned to roughly around 1,500 as the demonstration spread throughout neighboring streets. Demonstrators were confronted and beaten by Islamic Disciplinary and Security Forces armed with clubs and chains. Images of bloodshed were seen throughout the neighboring streets of Tehran University. Demonstrators held banners demanding the freedom of Akbar Ganji and all political prisoners. In addition, slogans such as "Political Prisoners Must Be Freed" were voiced throughout the city. According to eyewitnesses, about twenty demonstrators have been arrested and drawn into captivity. Furthermore, a number of demonstrators have been hospitalized to due severe injuries. WASHINGTON -- The State Department said it was disturbed by reports that peaceful protesters who demonstrated in support of a jailed Iranian dissident were treated brutally by Iranian police. Spokesman Tom Casey on Thursday called on the "regime" in Tehran to exercise restraint and permit the Iranian people to invoke their right to peaceful assembly and free speech. The statement followed President Bush's call Tuesday for the release of Akbar Ganji, a journalist jailed for writing articles linking government officials to murder. The White House statement was issued while some 300 Ganji supporters gathered in front of the Tehran University to demand his release. The Iranian government responded Wednesday that Bush should not intervene in the case of the jailed dissident, especially in light of allegations of U.S. human rights violations in Guantanamo Bay and Abu Ghraib prisons. In the meantime, 33 Iranian political activists asked the United Nations to press for Ganji's release, warning his life was in danger because of his monthlong hunger strike, the official Islamic Republic News Agency reported. Casey said Ganji was only one of many people thrown into jail in Iran simply for expressing their opinions peacefully. "There is no excuse for it," he said. "And it's not something the United States is going to stop speaking out on." The US Government elected officials are representing over 1 million Iranian-American community, adddressing their concerns and they have every reason to stop Islamist regime brutal practices by any means. The illegitimate Islamist regime in Tehran with support of less than 1% of 70 million Iranian people is not in any position and has no rights to speak on behalf of 70 million Iranian population. 4)	The Islamic Clerical Regime has executed over 120,000 political prisoners and freedom-loving Iranians in less than 2 decades. 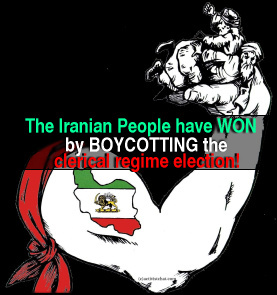 5)	70 Million Iranian people are hostage of Islamic Clerical Regime ruling by force and fear. FREE PRESS? Police beat protesters Tuesday at a rally in Tehran, Iran, calling for the release of jailed journalist Akbar Ganji. A woman, above, holds his photo. TEHRAN, IRAN � Iranian journalist Akbar Ganji entered the 33rd day of his hunger strike Thursday, demanding unconditional release from the notorious Evin prison in north Tehran. Iran's clerical judiciary said Thursday Ganji is receiving appropriate care and that he will not win early release. The case has long been a cause c�l�bre for Iranian journalists and rights groups. The life of Akbar Ganji, Iran�s imprisoned leading dissident, is under serious threat due to his illness and a month-long hunger strike, Human Rights Watch said today. Ganji, an investigative journalist who was sentenced to prison by the Iranian government in 2000, has lost more than 40 pounds during the past month. 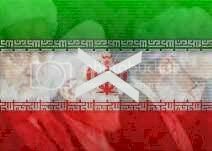 The Iranian judiciary imprisoned Ganji in April 2000 on vaguely worded charges, including �acting against national security� in connection with his participation at a conference in Berlin. He suffers from acute asthma that he developed in prison. Iranian officials imprisoned Ganji shortly after the publication of articles he wrote documenting the involvement of high-ranking officials in the murder of intellectuals in the 1990s. The Iranian authorities have repeatedly prevented Ganji from receiving specialist medical care or taking medical leave as other prisoners are permitted. In protest of his unfair treatment, Ganji began a hunger strike last month, and has since sustained himself only on liquids. Ganji has served nearly five-and-a-half years of his six-year sentence. Most prisoners in Iran are eligible for release after serving half of their sentence. 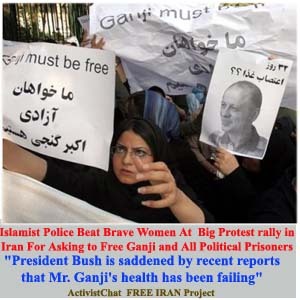 Ganji is one of the Iranian government�s most forceful critics. In his writings, he has criticized Iran�s system of governance. According to his wife, the judicial authorities have pressured him to �repent� for his writings as a condition for his release. In a letter smuggled out of jail last week, Ganji held Iran�s Supreme Leader, Ali Khamanei, directly responsible for his persecution. Human Rights Watch is concerned that, in light of Ganji�s recent forceful criticism of the government, the Iranian judiciary may try to prolong his imprisonment by bringing new charges against him. The Iranian government frequently has relied on laws that restrict criticism of the government and its leadership as a basis for bringing charges against dissidents. �After wrongfully imprisoning Ganji in the first place, the judiciary must not extend his imprisonment based on the opinions expressed in his recent prison letter,� said Whitson. Human Rights Watch called on the Iranian authorities to release Ganji immediately for medical treatment and to end its persecution of peaceful critics and dissidents.